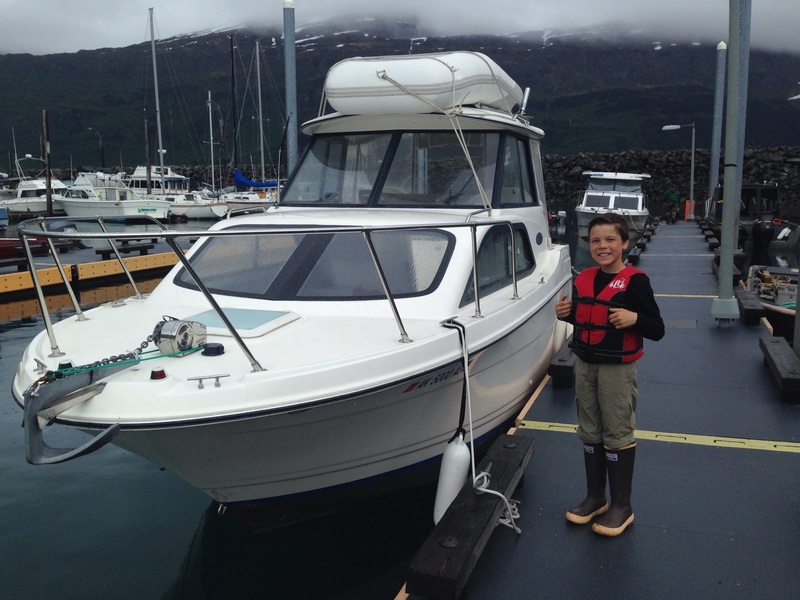 How crazy that we headed out for the first trip of Season 2 on our boat exactly one year from our maiden voyage . We live about two miles up a curvy mountain road, so pulling the boat up and down is no easy feat. We made it halfway down when Clark realized he had forgotten his wallet. Should we go back for it – which most likely meant we would miss the tunnel? Or should we push forward without it? In the end we decided it wasn’t worth the risk of boating without a driver’s license, so we headed back up the hill for his wallet. 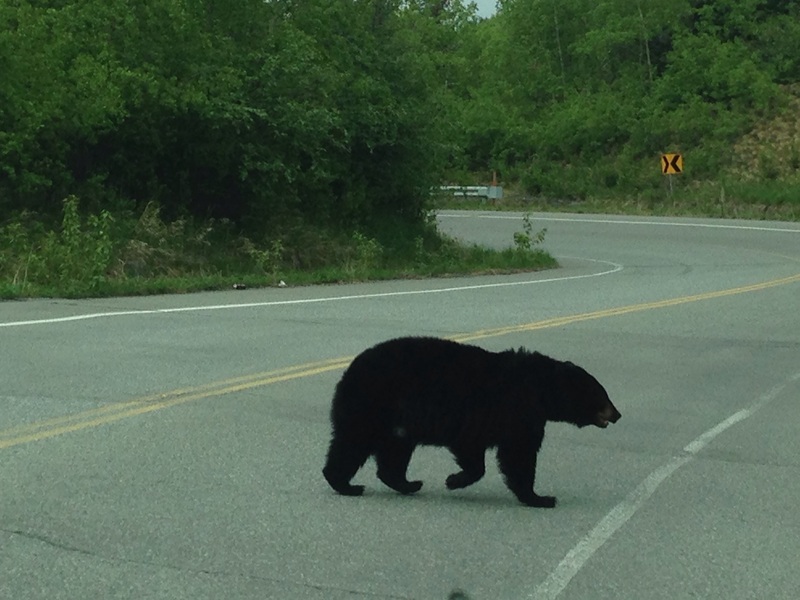 On the way back down we saw two beautiful black bears – talk about lucky timing! I decided karma was on our side for this trip! Because of the wallet delay, we didn’t expect to make the 2:30 tunnel. (It’s a one lane tunnel open for 15 minutes at the top of each hour out of Whittier, and then 15 minutes at the bottom of each hour into Whittier.) We rolled through the toll booth at 2:46… one minute late… but they let us through! Let the good karma continue! The kids saw some classmates coming into the harbor just as we headed out. It was a busy Memorial Day weekend, and we had waited until Saturday to hit the water. The weather was rainy and foggy, which might explain why so many people were heading off the water. Because of the fog, we motored slowly out of the harbor. We didn’t get far before Clark stepped off the motor entirely. “Nothing. Coast Guard!” he announced. 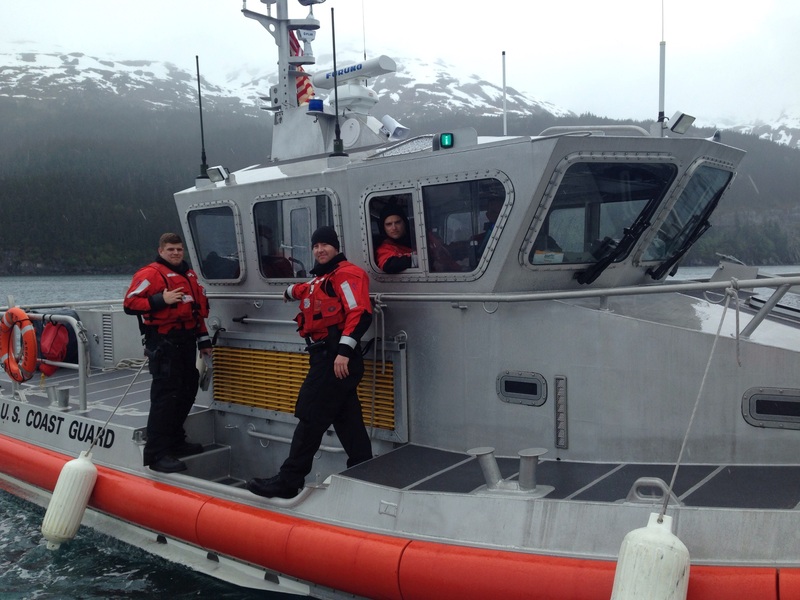 Suddenly a huge silver boat with a bright orange bumper was approaching our boat, and before I knew what was happening a couple of cute 20-something Coast Guard officials hopped on board with us. The first thing they asked for was Clark’s driver’s license and the boat registration. PHEW! So glad we went back for that license! We passed the inspection with flying colors. We had the horn, fire extinguishers, flotation devices, paperwork, flares, and everything else required for safety at sea. The guys were great with the kids – asked their names, answered their questions, and raved about a career in the Coast Guard! Because of the fog we decided not to go far. We popped into Shotgun Cove to check out camping opportunities. 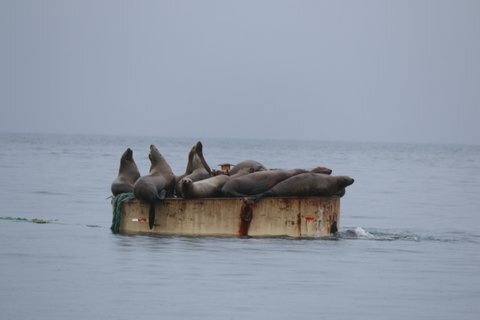 We were enjoying the honks and snorts of some sea lions when a co-worker of Clark’s pulled up nearby. 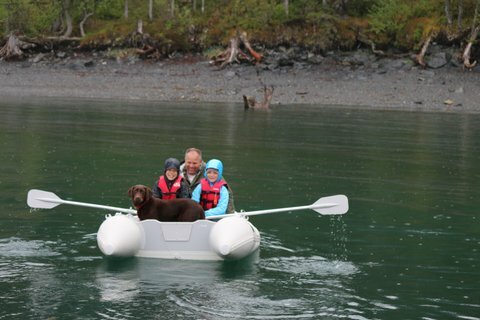 Candy and her family were on their maiden voyage and having a great time. We chatted a bit and then dropped our shrimp pots at the entrance to Shotgun Cove around 6:30. It was rainy, foggy, and in the upper 40’s. We dropped anchor for the night and took the dingy to shore. Clark, Tess, and the kids went first. When Clark oared back to get me, Tess finally proved that she can swim. She didn’t like it, but she doggie paddled along the dingy. Maybe she’s a Labrador after all! Bottom line: That dog doesn’t like to be separated from her peeps! 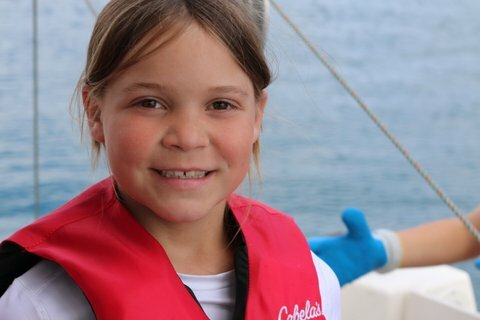 When we were all back on the boat I heated up some soup and chili while the kids played catch and release with little Pacific Cod. After dinner we played Apples to Apples and an incredibly biased trivia game called Beat the Parents. The kids creamed us. 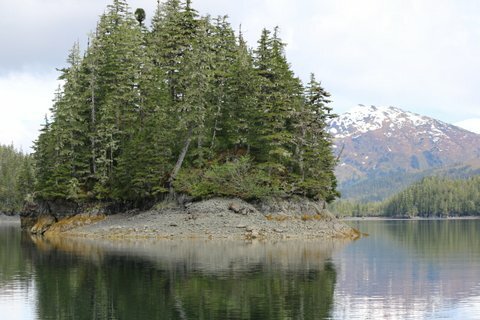 Clark was a hero and took Tess to shore one more time before bed – careful not to let her swim and get completely drenched this time – while the kids and I geared up the cabin for bed. It was a rainy night and we were grateful for the dry cabin, despite the wet dog smell. We even broke out Mr. Buddy to help stay warm! The kids slept great, but Tess was a mess. She is used to cuddling up with the kids at home and didn’t take kindly to being restricted to the floor. She was wet, stinky, and miserable! The next morning we woke to thicker fog and initially planned to head back early, but the skies cleared and we went exploring instead. We left Shotgun Cove and drove through new territory – part of Culross Passage to Long Bay. There were some narrow passages and it’s really best that I stayed down in the cabin, because I would have been a nervous wreck (okay, more of a nervous wreck) had I seen the charts in live time! We saw some seals in Long Bay – one was perched on a rock like a giant white smiley face. Probably happy to see the sun! 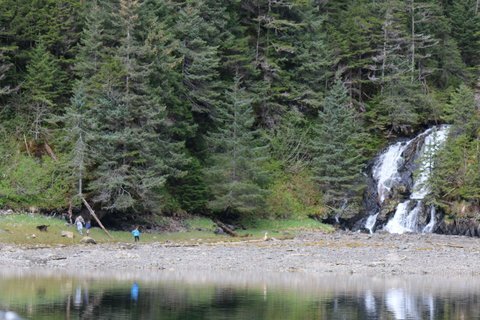 Clark and the kids went to shore to explore some waterfalls in Long Bay. Tess ate a fish and lots of grass, and before they knew it she had vomited 13 times. 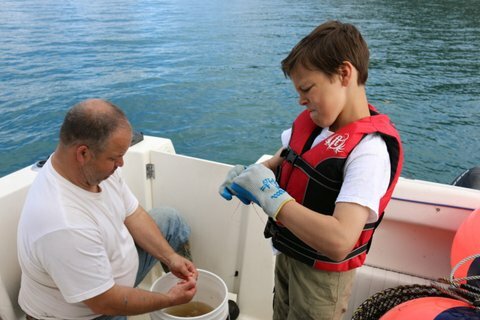 Clark thinks it happened too fast to be from the fish, so we are hoping it wasn’t sea sickness. She threw up two more times on the boat deck and it was almost entirely grass. We hope this was a one time fluke! On the way back to our shrimp pots at Shotgun Cove we saw a few porpoise! They were our first. They didn’t play in our wake, but hopefully next time! Around this time the Coast Guard approached us again, but we showed our copy of the safety inspection and they waved us away. They yelled, “Hi again, Sam!” as they drove away. Crazy that they remembered his name! 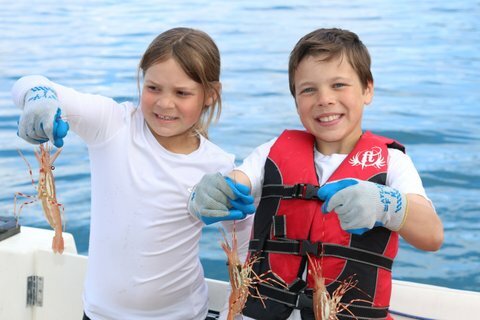 The kids helped a lot – and were very excited – when we pulled up 82 shrimp! Clark bought us all new gloves that made both pot pulling and shrimp counting easier. From Shotgun we trolled at 2 MPH with the kicker back towards Whittier. 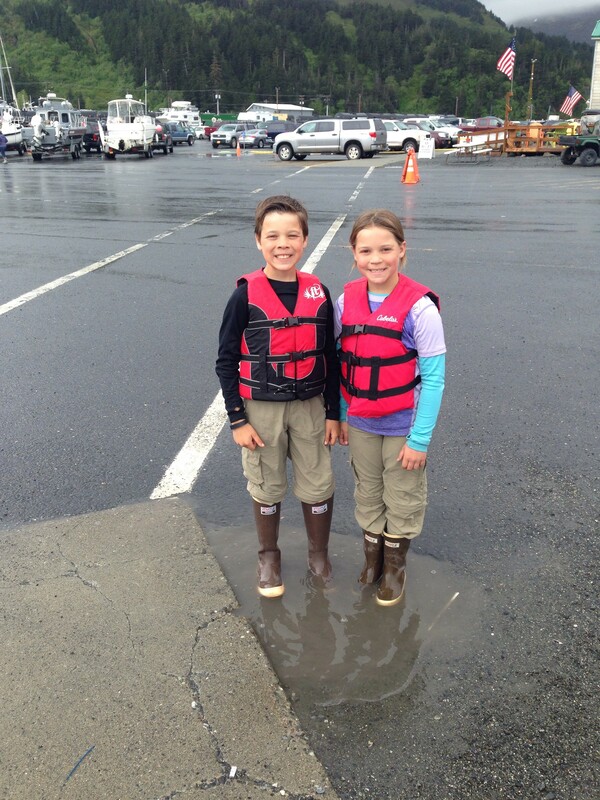 We all dreamed of catching a king salmon, but no luck. While trolling we spent a considerable amount of time planning a new strategy for landing the boat. Instead of me jumping off the bow (which didn’t work so well last year!) Clark now asked that I simply ride up there as we cruised into the harbor, and then lasso us to the deck with the bow line. 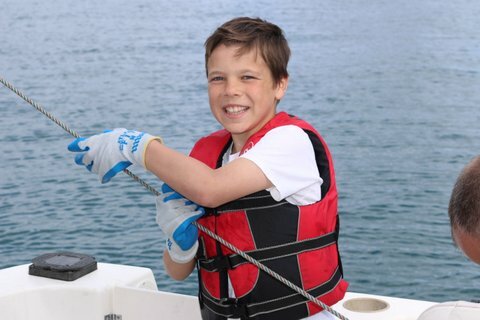 We gave Sam the stern line and he was eager to help – he’s almost 11-years-old so it’s time to learn! IT WORKED! For once we safely and securely (without incident) landed our big giant boat all by ourselves. I was so relieved that I burst into tears! A redemption trip! Unfortunately, the elation didn’t last. Clark’s truck wouldn’t start at the parking lot: dead battery. But he got a jump-start and we made the 7 PM tunnel out of Whittier. Phew… the trip was a success after all! Next Next post: We Have a Tweenager!